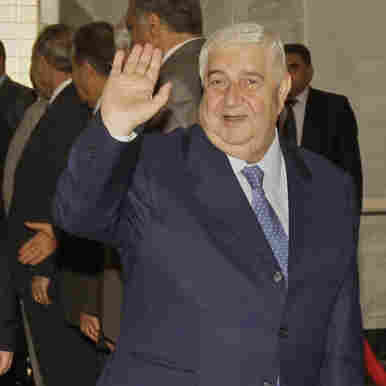 Syrian Foreign Minister: Opposition Should Join 'Dialogue' : The Two-Way If those demanding reform choose to ignore President Bashar Assad's call for a "national dialogue," reforms will be made without them, Foreign Minister Walid Moallem says. Even as there were more reports today about deaths of demonstrators in Syria, the country's foreign minister was telling reporters that President Bashar Assad's regime is serious about wanting a "national dialogue" that will lead to reform. NPR's Deborah Amos was among the reporters who Walid Moallem spoke with in a series of one-on-one interviews in Damascus. As Deborah will report later on All Things Considered, the minister "was delivering a message: The protests must end — and Syrians have to come to the table and change the constitution. They need to hammer out an election law, a new media law – creating a multi-party democracy – in a process [the 'national dialogue'] that begins on July 10th." "Now, the opposition – an older generation of critics – and the organizers of the street protests have rejected any dialogue with the government until the violence stops," she adds. "When I asked the foreign minister who he was going to talk to, he appealed to the demonstrators to come and talk, saying they have only two options: either to continue demonstrating and demanding the fall of the regime, which he said isn't going to happen, or 'to come discuss the issues.' "
-- On What Assad Has Promised: "When President Assad put the constitution, which is the basic law for any government and country, to the public to be changed. ... When he speaks about a draft law of parties, and a new law for parliamentary elections. ... [About laws] for freedom of information and media and for local elections economic reforms. Do you think this is not building a new Syria? A new democracy?" -- On Why The Opposition Should Come To Talk: "Let's first classify this opposition. We have demonstrators in the suburbs of many cities that have daily demands, which in my opinion, the government needs to address. These are a majority. We have another majority, which is [the] independent majority, the silent majority of Syria. And we have the opposition, who are urging political reforms. In my opinion, if [the] opposition refuses to participate they will [be making] a real mistake. Because the conference will be held, and these draft laws will be adopted." -- On The Need For "Wise" Heads: "There are young people demonstrating [in] the suburbs ... and when I say young, this means their anger is quick. Maybe they need some older, wise people to come together to build the future. This is my appeal." -- There Are Only Two Options: "People have two options, either to continue demonstrations [calling for] the falling of the regime, which will not happen, or to come to a more historic opportunity to discuss the issues — to be part of building the future of Syria. In my opinion, this is [the] way." -- How To Convince Opponents To Talk: "I don't need to convince them. If they [want] to build the future of Syria, to be part of this process, they don't need to be convinced, they have to come." More from Deborah's conversation with the minister will be on All Things Considered. We'll add the as-broadcast version of her report to the top of this post later.